The beauty and skincare market is exploding. The number of moisturisers, serums and SPF products out there is over whelming, with a huge number of similar products all boasting the same claims. Every now and then however, something new appears that makes you sit up and pay attention, and call it beauty blogger intuition, but I seem to be fairly lucky when it comes to sifting through the bulk and finding the truly wonderful products. If you’re tired of your usual moisturiser or pre-makeup skincare combination why not try one of these – from the new generation of skincare, with more skin loving benefits and age defying innovations that ever before! Before I say anything about this serum, I first need to point out that it is £218. There we go, I said it. Phew. When you first glimpse the label for this pricey cream, the first thing that’s probably going to enter your head is * what * could possibly make this serum so different from any other serum you’ve tried before? And also, what the heck is Swiss Cellular Ice Crystal Technology? La Prairie write that taking the extracts from flowers able to survive the harsh environment of the Swiss Alps and infusing the serum with this formula, can enhance the skin’s environmental resilience. Now I’m not too sure how similar our skin and swiss flowers are exactly, but it’s a lovely idea, and there is also a serious arsenal of powerful ingredients inside the serum too. Emollients, antioxidants, amino acids and other active ingredients are scientifically proven to make skin look and feel younger, and who doesn’t want that?! Specially formulated for skin that is only just starting to develop the early signs of aging, it’s been called an age-delaying serum and it works to relieve the signs of fatigue, dullness and dryness, all of which I can confirm it most definitely does. Before using the serum on a daily basis my skin would look dull and tired, where as now I look and feel more hydrated, with the serum imparting a youthful glow immediately upon application. The iridescent serum is dispensed by pump, with the perfect amount for your face and neck distributed in each pump, and skin looks and feels instantly smooth and soothed. While I don’t have any wrinkles yet, I’m promised that I’ll benefit from this age-delaying technology in the long run, but immediately I’m benefiting from anti-pollution protection (thanks, Swiss flowers!) and the anti-inflammatory benefits within the serum which work to fortify skin’s barriers to environmental aggressors. Cellular Swiss Ice Crystal Serum is a lightweight age-delaying serum that helps relieve signs of fatigue: lines, dullness, dryness. Deeply hydrating, it imparts a youthful-looking glow upon application, instantly smoothing, soothing and replenishing skin. Over time, skin is brightened and skin tone is more even, with diminished wrinkles. The Swiss Ice Crystal complex provides anti-pollution protection, has anti-inflammatory benefits and boosts microcirculation to fortify skin barriers. Pricey, yep absolutely, but so far I’d have to say that it’s the best serum I’ve ever tried, and a firm staple in my daily routine. If you’ve got the budget for it, then go for it, I truly recommend it. A new one in my skincare collection, but within a week this had been added to my everyday skincare routine. The Dr. Sebagh Supreme Day Cream is a light and luxurious day cream, in a beautiful light pink shade (shallow I know, but I like the colour!) with a delicate, inoffensive floral scent. Upon application you’ll notice the velvety texture, and marvel at how quickly it sinks in, no matter how little or how much I use. Consistency wise, and the way that my skin enjoys drinking in the product, I’d compare it to the Charlotte Tilbury Magic Cream, only it sinks in far quicker and I’m ready for the next step of my morning routine in just a few moments. I must admit, I used this for about a week before actually even picking up the press release, and when I did, I was blown away to discover why this Day Cream is so different to any other I’ve tried before. The Supreme Day Cream takes protection against environmental damage to whole new levels, shielding skin against High Energy Visible Light which is of course emitted through daylight, but also by laptops, tablets, mobile phones and more. It can be just as damaging as the effects of UVA and UVB light combined. WHY DID NO ONE TELL US THIS SOONER?! The rich cream contains a cocktail of antioxidants to protect our skin from HEV light, as well as giving anti-pollution benefits, but Dr. Sebagh chooses not to compromise this very specific protection by adding SPF, but read on to find out how I combat this. I’ve been using the cream for 3 weeks now, and my skin, hand on heart, with this combination is the best it’s every been. This won’t be the last time you hear me rave about the Dr Sebagh Supreme Day Cream, I assure you. 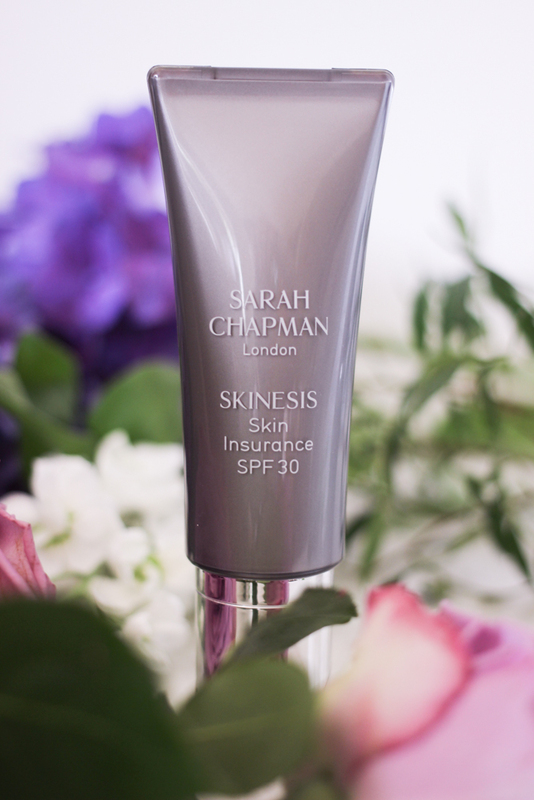 And finally, the pièce-de-la-résistance of my three step, uber protective skincare routine; the Sarah Chapman Skinesis Skin Insurance SPF 30. This product arrived on my desk just as I discovered the need to add additional UVA and UVB protection to my morning routine, upon reading the Dr. Sebagh press release. It was a sign, the timing couldn’t have been more perfect. To round off my routine, I have been using the protective cream, which you apply after your moisturiser, before your primer (but it can also take the place of primer too) to protect your skin from UVA and UVB, as well as free radicals. Yes, there will be NO free radicals harming my skin after this through routine. As well as this, the cream gives an optical blurring effect, it’s lightly tinted and gives skin a smooth finish, so on days when I’m working from home or going for a more relaxed look, I don’t even apply my tinted moisturiser after this. The texture is dreamy – lightweight and silky, and adapts instantly to my skin tone. I didn’t even notice this until I truly thought about it, it just feels right. My skin looks and feels healthy after application and I am comfortable knowing that I’m protected from pretty much any environmental damage that London’s smog and occasional sunlight can throw at me. Truly, I am smitten with my new 3 step skincare routine. I feel utterly protected and my skin is thanking me for it in the short term too. Skincare is something I always suggest investing in, and these products get a massive tick of approval from me. I’d love to know if you’ve tried any of these products or if you’re now tempted, do you believe in investing in your skincare?